The Fujitsu LOOX F-07C might not ever come to the States, but its 1.2GHz Intel Atom processor coupled with 1GB of LPDDR400 RAM are certainly worth a mention as that is just enough of a horsepower to let it dual-boot into Windows 7 and Symbian. You read it correctly – the Fujitsu LOOX F-07C is the first phone with Intel Atom and running on Windows 7, not Windows Phone 7. While you shouldn't expect desktop-like performance, the phone maker promises you could handle simple tasks and even includes a 2-year license for Microsoft Office Personal 2010. To make the spec sheet even more impressive, the rather heavy 7.7-ounce QWERTY slider packs a 4-inch LCD screen with a resolution of 600 x 1024, translating into an impressive pixel density of 297ppi. For your photographic needs, on the back you have a 5-megapixel CMOS snapper, while on the front there is a VGA camera, a welcome addition for video calls. You might have already guessed that the weird device is aimed at the experiment-friendly Japanese market arriving on local carrier NTT DoCoMo. While the spec sheet for the device is preliminary, the battery life seems very realistic as in Windows 7 it will only last you two hours before switching back to mobile mode. With the energy-efficient Symbian, however, you’re looking at 370 minutes of talk time on a 3G network. All that goodness is coming this June or July and to own it, you’ll have to swallow the bitter pill of nearly $860. Take a look at a hands-on video of the device, courtesy of Japanese blog Akihabara news and feel welcome to share your thoughts about the crossover device in the comments below! How The Hell They Managed To put a resolution of 600*1024to a 4" screen ?? Seems That Samsung And Apple Are Below ! Wake UP !!!!! 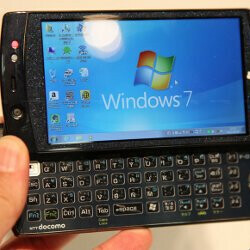 What is the reason of putting Windows 7 on such device with such screen? Retina display it's 325ppi this phone has 297ppi still less than Retina display and more than super Amoled plus! Soon all phones will be like this :') im so proud. Great concept idea, but in the states we'd prefer WinMo 7 to Win7. The true joy of smartphones now is their essentially barebone PC's capable of running anything (with enough ROM work). Getting a device to dual boot anything stateside would be strongly greeted. I'd love to have Android and WinMo on a decent piece of hardware. I am 4 months overdue for an upgrade and in dire need of a new device and still on teh fence as to what App market I want to back for the next two years (to say nothing of which carrier). This is a great step to get two worlds to one device...lets hope a stateside carrier (or ROM developer) finds a way to do the same. Windows in your pocket! Awesome!